A woman enjoys some fly fishing in the Salmon River near to the town of Main Brook, part of the Viking Trail, on the Great Northern Peninsula of Newfoundland. This area is known for fly fishing and it caters to people of all skill levels. This woman here is practicing her fly fishing technique in the Salmon River near the town of Main Brook, which is on the Viking Trail in the Great Northern Peninsula in Newfoundland. This area of Canada is known for its fly fishing and many people come here to partake in the relaxing sport. 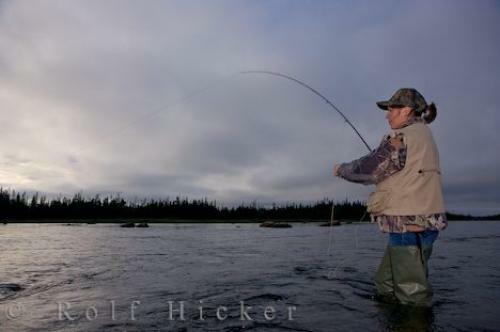 Fly fishing does take some skill to get really good at it, but if you are in this area of Newfoundland and you want to try it, it is a great place to hire a guide and to do so as it caters to all skill levels. Photo of a Woman fly fishing in Salmon River in the town of Main Brook, Great Northern Peninsula, Newfoundland. ... to the lap of the water against your boots, the sound of your fishing line as you cast it in to the water once more, and the sounds of nature around you and even if you catch nothing it still can be a great way to spend a day. There are over a dozen rivers in this area that contain salmon stocks, with the Salmon River being one of the most famous. Fly fishing is an excellent way to catch both salmon and trout. I photographed this photo with the digital SLR camera model Canon EOS-1Ds Mark II, aperture of f/5.6, exposure time of 1/400 sec. on ISO 200, as always I used a original Canon Lens, the focus lenght for this picture was 24mm.